The TS 1000 System Series is a stand-alone Active Shooter Suppression System. The system is designed to Deter, Disrupt, and Delay™ active threats inside of buildings using pressurized water with active ingredients. This active water irritates the eyes, nose, lungs, and throat, and stings the skin, within seconds rendering the perpetrator unable to focus on continued violent behavior. The shooter suppression system can be installed in entrances, vestibules, lobbies, hallways, common areas, offices, classrooms, workplaces, and any other area of buildings deemed vulnerable by the building owner. Full coverage ensures a person posing a threat will not be able to move to an unprotected area to continue perpetrating violence. Fire and Building Codes do not address or limit installation of the shooter suppression system. Ease of installation in new and existing structures allows the building owner to quickly provide a greater level of safety to building occupants. 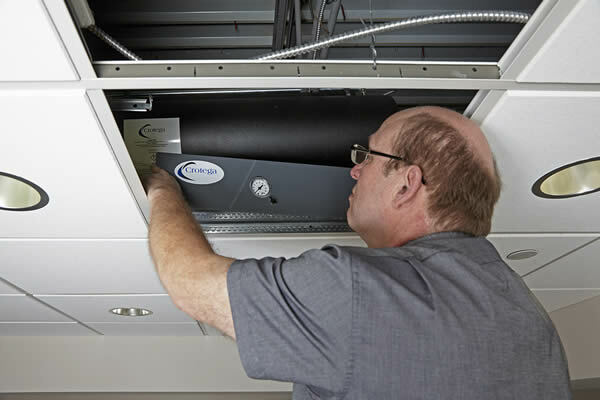 The shooter suppression system is installed and commissioned by certified installers. Annual certifications are required by the manufacturer for proper maintenance and operation. 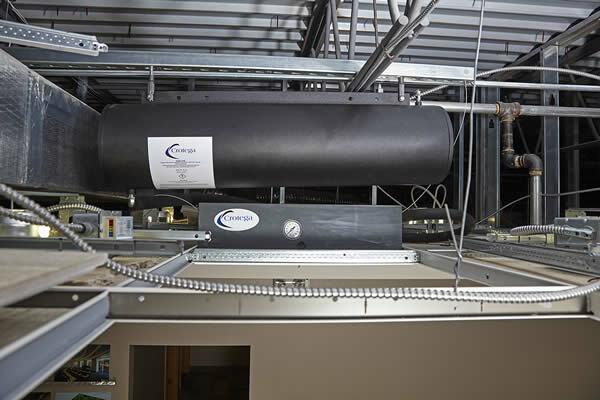 The shooter suppression system has models for various ceiling installations. The system is made up of several separate components: head unit, tank, water-based solution with active ingredients, cameras, emergency switches, and controls. Head units can be mounted above suspended ceilings, recessed into ceilings, attached below ceilings or in exposed mechanical ceilings. TS 1030 – Pendant mount in exposed mechanical ceiling. Controls the shooter suppression system Drone Units within each Zone. A Master Kit is sent with each unit for installation of the necessary module, Activation Device, and Zone Camera. Is controlled by the shooter suppression system Master Unit within that Zone. These are distinguished from the shooter suppression system Master Unit by the components within the drone enclosure. TS Zone Extension Unit contain a control module to extend the number of drones per zone and will NOT be able to connect to the Zone Camera or Activation Device. Is controlled by the shooter suppression system Master Unit within that Zone. Shooter suppression system Drone Units do not contain a control module and will NOT be able to connect to the Zone Camera or Activation Device. The Repuls 304 Stainless Steel Tank holds the solution and is pressurized to a specified amount. A mounting bracket is located on the top of the tank along with an ASME pressure relief valve set to relieve at 100 psi. Push-to-Connect fittings provide ease of installation of the connecting hose. A protective sleeve is placed over the tubing for plenum rating. Repuls Tanks are connected to individual Sentrē Units and must be mounted in close proximity to their assigned unit. The mounting bracket on top makes installation quick and easy. Each Repuls Tank must be mounted in accordance with local, state and federal regulations. Each tank comes with two 3/8” threaded yokes with easy-to-install pins. The shooter suppression system Master Unit can be put on Alert through several technologies depending on the needs of the building manager. Only Crotega certified technologies are permitted for integration into the TS 1000 System. The TS 1000 System requires visualization of the threat before deployment of Repuls. To ensure coverage of each zone, Onvif compliant cameras are installed in each zone so that the user can analyze the threat and deploy from the safety of a removed hard location. Zone Cameras must be in position to observe the complete zone. The TS 1000 System is run on a central Control Panel. Custom programmed for each order, the shooter suppression system Control Panel houses the hardware required to run each Sentrē head, communicate with each System Touchscreen, and power the entire TS 1000 System in case of a power outage. Weight ranges from 15 to 20 lbs. The TS 1000 System is controlled by the user via an intuitive tethered industrial touchscreen made for easy navigation, simple deployment, and mobility during an active threat situation. The touchscreen is non-wireless for cybersecurity purposes. Installer certification authorization by Crotega, LLC. Shooter suppression system mobile fill station.